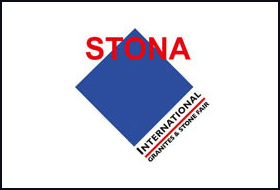 The sunny city of Bengaluru, in south India, hosted the 14th edition of Stona Fair, the major event in natural stone sector in the sub-continent and one of the biggest world-wide. Thanks to our multi-marketing approach Winoa and our partners attended this key bi-annual appointment from 7-10 February at Bangalore International Exhibition Centre, Bengaluru, India. As usual, our customers’ reply reached our expectations and they visited us in masses, talking shop and sharing a warm cup of "massala tea". This year we had opportunity to tease some identified customers to boost their slabs recovery, with our new Prima S, produced by Winoa. The product has shown some excellent results; and some of our customers already use it. Our attendance to this show allows us to measure our expertise to the new trends of the market and still being a major actor in this competitive word. Our presence was once more a success, our team had the opportunity to exchange and share with some architects and designers, and then being on point with the coming trends, and customers needs. Stona, we’ll be back for more!